The Moose Racing Qualifier Jersey is simply a well-made, well-designed dirt jersey. It is not some frilly, gaudy, attention-seeking billboard. It is attractive, understated, and functional. This is a welcome departure from modern MX gear for a lot of us. The jersey is polyester with sublimated graphics. What does "sublimate" mean? Well, Webster's Dictionary says, (verb) "to divert the expression of (an instinctual desire or impulse) from its unacceptable form to one that is considered more socially or culturally acceptable." Still not sure? Me either. But I like the graphics. The jersey has an open-sleeve cuff to provide excellent air flow and no restriction in the glove zone. It also features raglan-style sleeves for ease of movement. It has a comfortable V-neck and a generous "American" cut. Hey, I take that personally! The four color combinations all have black as the main body color. The accent colors are grey, blue, orange, and red. The size offering range is huge, running from small to 5XL (the guy that fits into that last one had better have a BIG dirt-bike). Anyway, this is a great jersey at a great price. 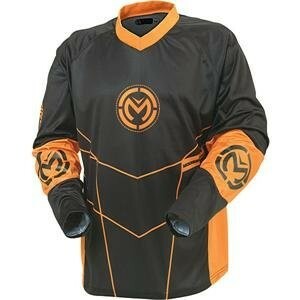 Click here to find this jersey on Revzilla.com.